It is a book by Anjum Anand in which I tried all her recipes except few non-vegetarian recipes.I liked all of them and here comes my next entry after the Paneer Bruschetta from her book. It has now become as one of the most wanted gravies by my family members. I am sure you also like it. 1) Wash and cut the chicken into cubes. Mix all the ingredients given for marinade and then mix with the chicken cubes. Marinate it for minimum of 30 minutes to maximum of 8 hours or overnight. 2) Dry roast the ingredients given for roasting and make a fine powder of it after it cools down to room temperature. Colour of the spice powder differs based on the quality of the ingredients used. 3) Heat oil in a thick bottom pan. Add onion and saute until it turns translucent. 4) Add the ginger garlic paste given for gravy. Saute for 1-2 minutes. 5) Add tomato paste and cook until the oil separates from it. 6) Add the dry roasted and powdered spices to the gravy. Add 1/2 cup - 1 cup of water to the pan and continue heating until the gravy comes to the homogeneous state. 7) Add the chicken with its marinade. Continue cooking over a high heat, stirring constantly until the yogurt get incorporated with the chicken. Add salt and 1/2 cup of water. Mix well. 8) Cover and cook for 5-10 minutes on low flame. After 5 minutes, stir often, as it help the sauce to a creamy consistency. 9) Taste and adjust the seasoning. 10) Add lemon juice and curry leaves. Serve hot with steamed rice. 1) After adding chicken, it is optional to add water. Chicken cubes itself leaves out some water while cooking. So increase or decrease the water quantity as per your need. 2) Add water with the powdered spice mix to avoid lumps. 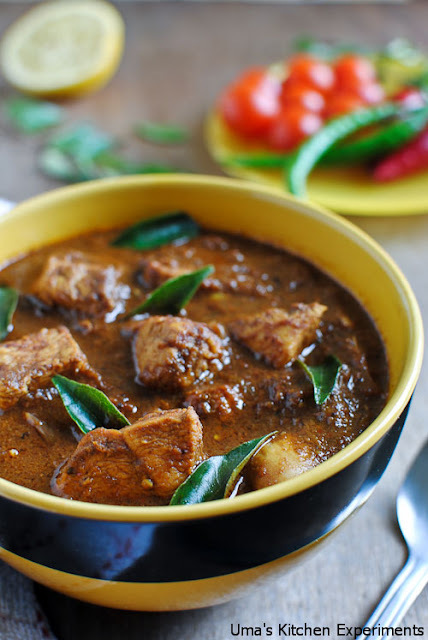 Spicy chicken curry looks awesome and yummy. Even I am yet to make Paneer Bruscheeta of your's ! 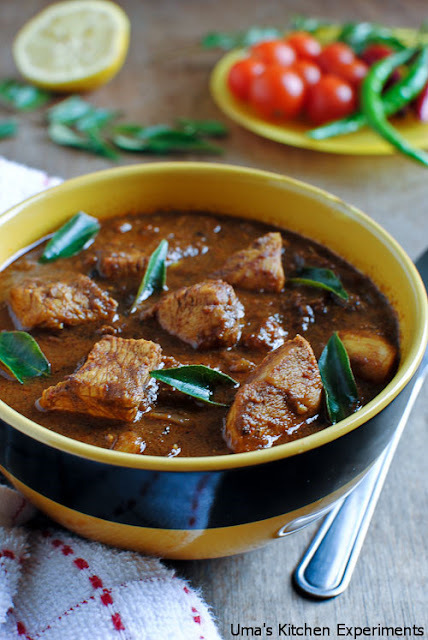 this chicken curry looks inviting...Does it have to be with boneless pieces only? Cloves in meats always work like a charm. I love recipes that use cloves ( more cloves than usual one or two).. beautifully done post and fantastic pictures. What an attractive color! simply mouthwatering..bookmarked. First time in ur place. U have a lovely set of recipes. All looking so good. Andhra chicken looks so mouthwatering. YUM! Uma,I had tried your curried apple ,all liked at home.. I'm pinning this to make later, looks and sounds perfect for my family. 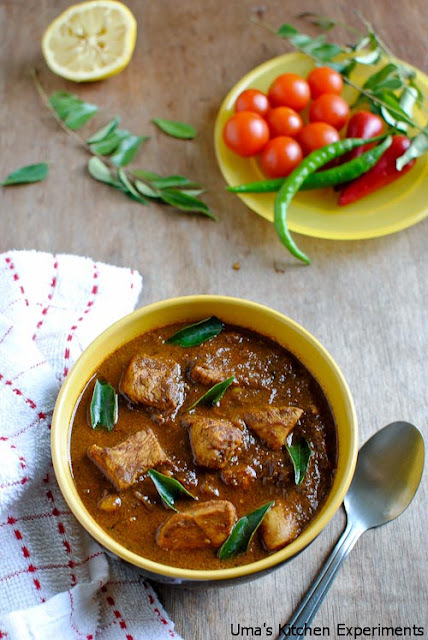 beautiful clicks as usual...chicken curry looks very spicy and tempting. I love curry, nice recipe. This looks tempting and I must say, you have a lot of patience in taking all the step-by-step pics..Gr8! A great curry, love the colour and the spices in the masala. Thanks. I can't get it to turn out that dark brown. maybe the wrong seed is the problem! I used only poppy seeds not sesame seeds. It also called as kasa kasa. Colour of the recipe is not a problem. I got this colour due to masala which I added (which is from black pepper, cinnamon and dry red chilli). you can refer the picture for the colour of the masala. Right on. They're white poppy seeds then, I thought they only came in black. I'll have to try that sometime! great receipe .. at first look it seemed like any indian buffet chicken curry but once cooked .. WOW! . THANK YOU. Abba Abba Abba, Mouth watering i am going to try it right now Bye. I am having guests come over in 3 hours and I have used all the spices I had to make the masala powder. Unfortunately, I made the mistake of adding a couple of cardamoms and now the masala powder smells funny. Would continuing with this powder be fine or would I have to rush to the Indian grocer at the other end of town to buy more spices? Sorry. I happen to see your message now only. 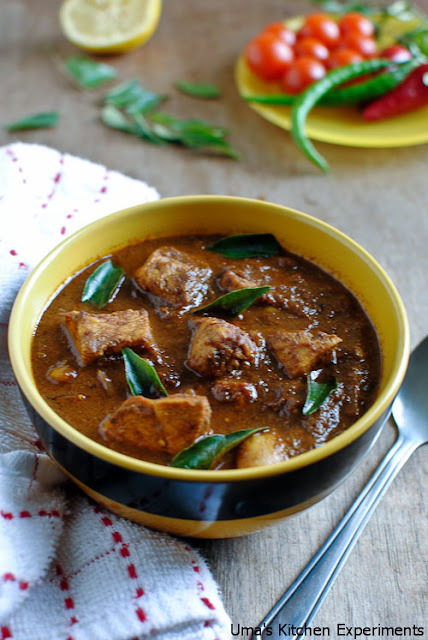 you can continue with the masala with cardamom to prepare this gravy. It slightly change the taste and favour but otherwise fine. Casually came across this recipe and asked my wife to prepare..it came out wonderfully well..thanks..
Looks perfect..any alternative for the poppy seeds..as they r not available here?? Very tasty... But also very fiery 😀. Next time will reduce red chillies and pepper for sure! Ttried this recipe today but increased the amount of black peppercorn and dried chilli and also added fresh whole chilli. Very tasty. Awesome recipe tried it and loved it was doubtful first but outcome very good.